At the station, Steve ordered Laksa noodles for me for breakfast (served with egg), and then we caught the 7:50AM ferry from Vivo City to the Sekupang terminal on Batam Island, Indonesia. 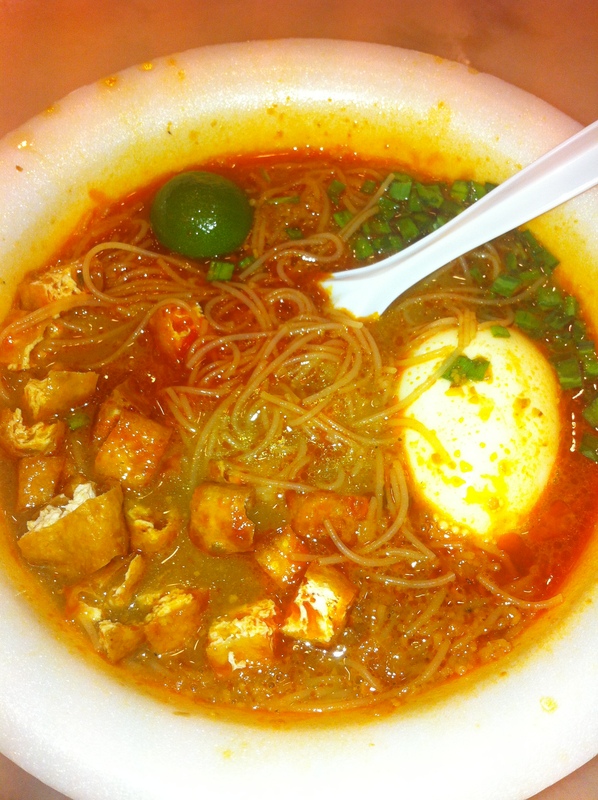 This was supposed to be a meal of spicy noodles, but they weren’t really spicy. Steve had a HUGE “dollop” of chile paste added to his meal, which caused him to break into a small sweat. Mine, not so much. It was tasty, don’t get me wrong; it just wasn’t as “hot” as I imagined it would be. 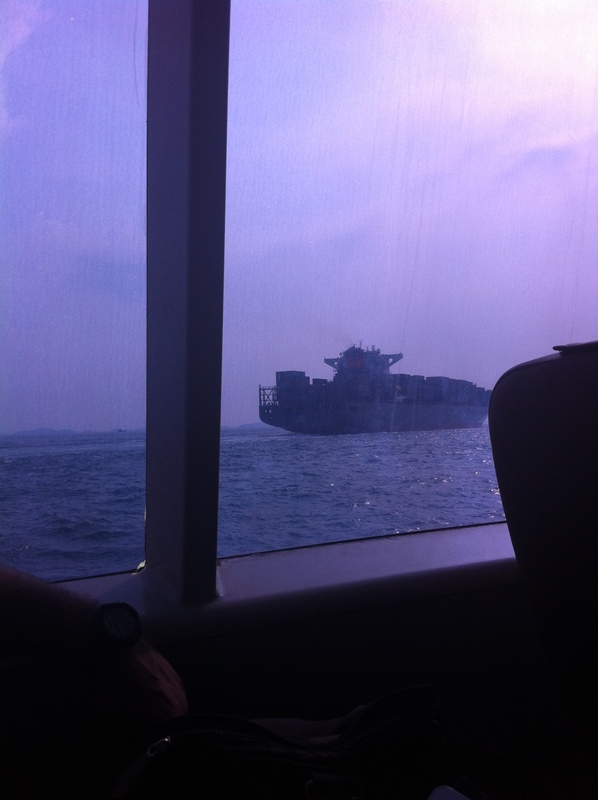 At 7:50AM, we took the ferry over from Singapore to Batam Island – about a 45 minute ride. And, I’m telling you…this was the most well-organized, easy-going trip – ever! Try as I did to tick Steve off by having “blonde moments”! 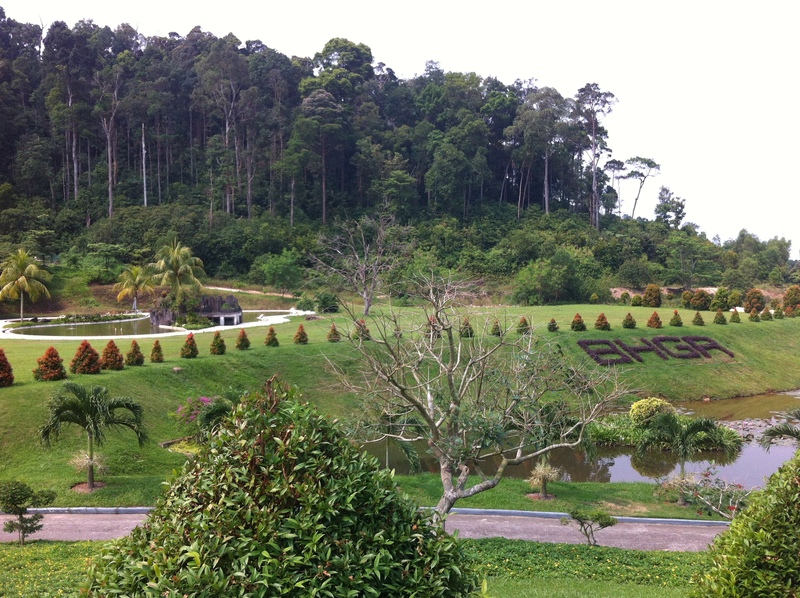 Once we arrived at Batam Hills, from the moment we stepped onto the golf resort grounds, every woman – to a T – said I looked like a doll, Barbie! Ummm?? But, it sure was nice to have women saying something nice to me! 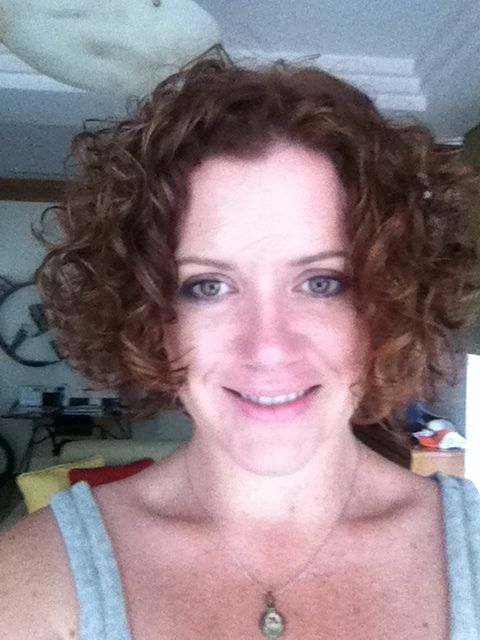 It was the curls (thank you Pamcakes and TK), and the color (thank you, Michael!) that had them complimenting me at every turn! 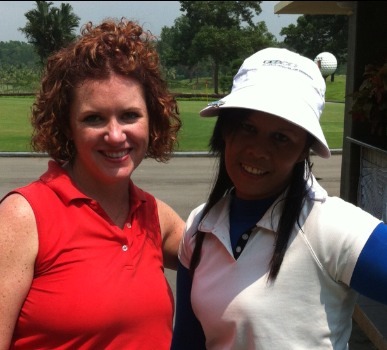 Me and my caddy for the day, Riyama. After that extremely fun round of golf (if not a “good” round of golf), we grabbed lunch at BHGR. 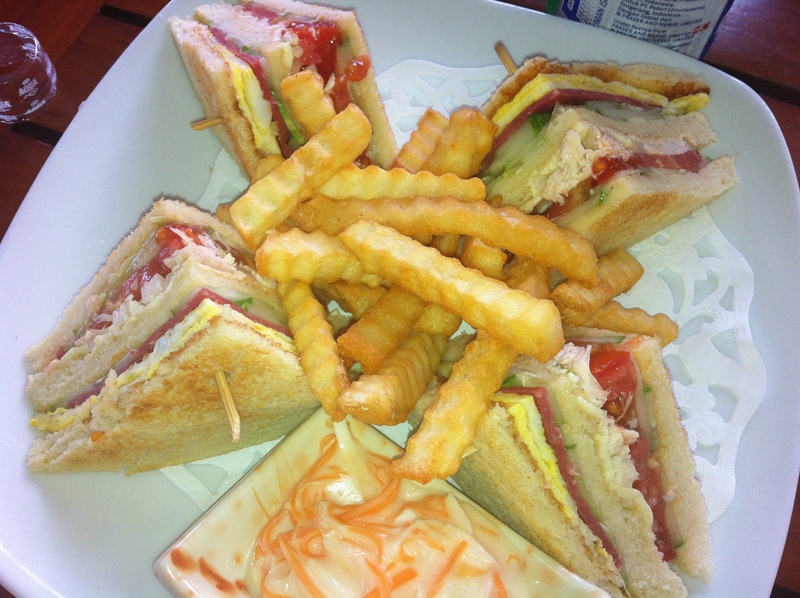 I was served the “Batam Hills Sandwich” – which included chicken, beef bacon, tomato, cucumber, egg, and mayo – I suppose it was an Asian version of the Club Sandwich. I wasn’t sure whether I’d like it, but it was quite tasty. It was unexpectedly refreshing with the cucumber and tomato. I finished the full sandwich easily. I also dug having the french fries with chile sauce (they have a nice, spicy chile sauce at the club). He was making waves for us to cross over. Steve and I had ~an hour to regroup before heading over to Boat Quay. One problem…thunder and lightning struck about 10 minutes before we had to leave. I admit that I was a bit of a pansy, and after giving Steve crap about getting a taxi to take us places earlier in the week, I (more than once!) asked “are you going to make me walk through the storm? ?” He did (though it wasn’t storming yet). 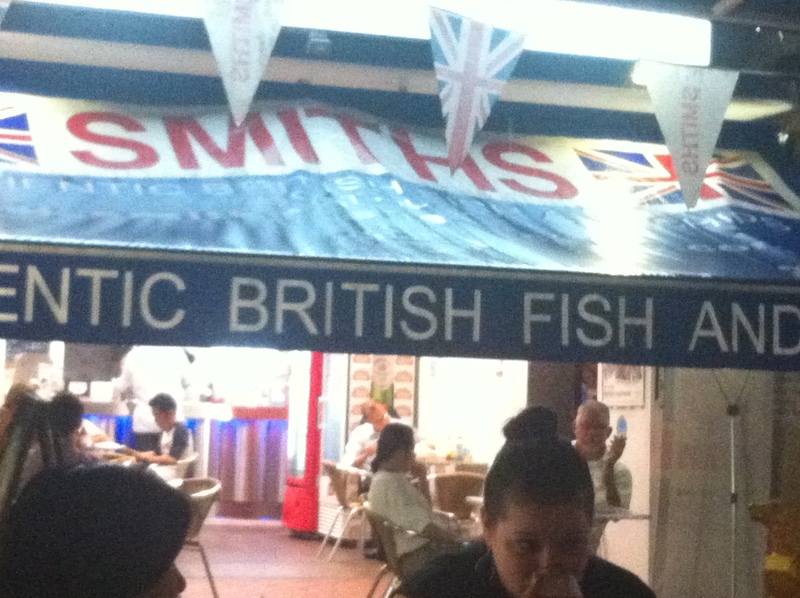 We grabbed umbrellas and headed through Robertson Quay to Clarke Quay and over to Boat Quay to “Smith’s Fish and Chips“. And…we beat the rain!! VICTORY!! Once there, I was reacquainted with Bryan, whom I had met Friday night, and I met a few others – great people! And, as the night progressed, I was reacquainted with more and more (now) familiar faces! We also watched an incredible thunderstorm (with brilliant lightning) from the deck of the restaurant. I’ve never been outside in such a storm, but nobody else flinched, so I powered through it! Steve ordered me fried cod for dinner. Holy I-can’t-finish-this-portion dinner! Quite tasty, mind you. 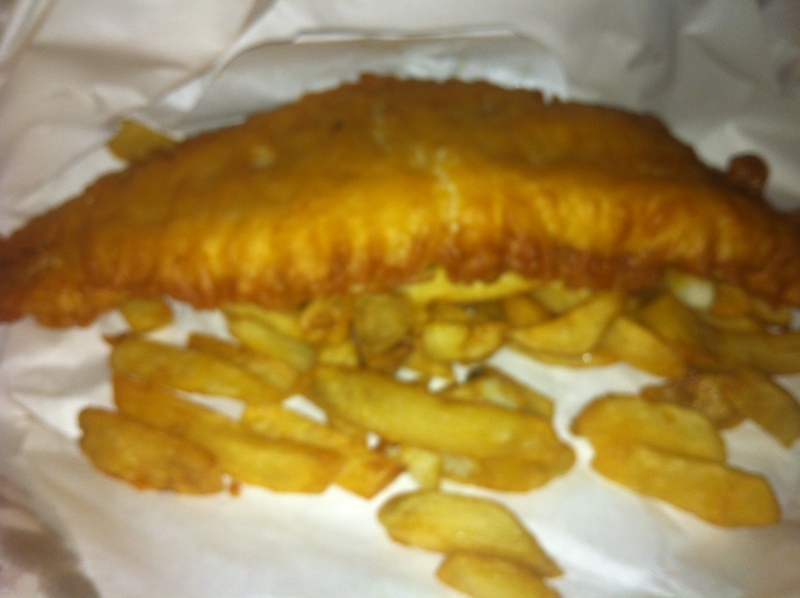 The fish and chips (fries) were delicious with vinegar and salt. But, dear gosh… a HUGE portion! It took me forever to even get through a third of this portion, mostly because I was chatting up a storm with Steve’s friends. Again, really cool men. It was ~9:30PM by the time we left. AKA: way past Steve’s bedtime. No judgement…dude knows he needs sleep. 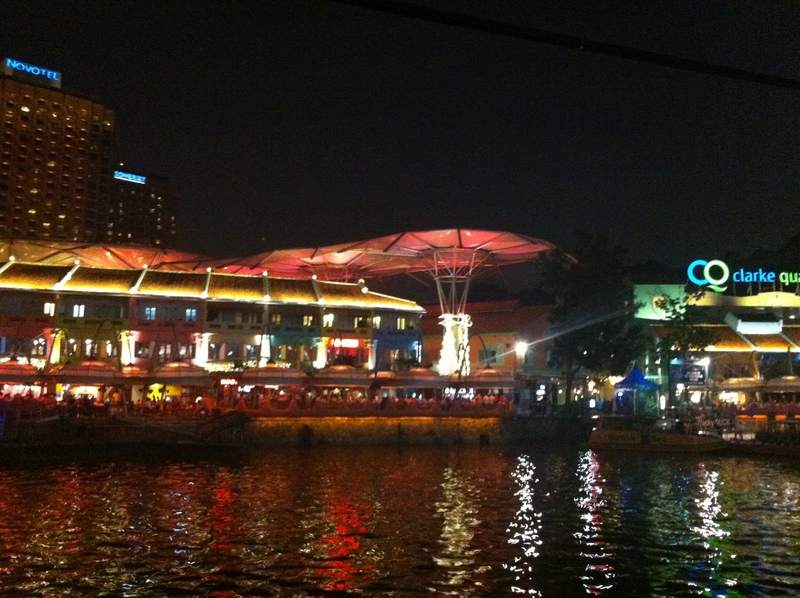 As we walked home, I couldn’t resist the urge to take a picture of the view of Clarke Quay at night – it was beautiful! I know Steve loves his sleep, so I was grateful to Bryan for going out and grabbing a beer with me at Harry’s (Steve’s local “haunt”). I have a hard time going to bed early, and it was nice to spend the evening chatting with a friendly man. Bryan is a gem to be around. He’s a hunter, a beer drinker, a cook, and a family man…we shared stories about food, family, and Steve. 😉 And, now I know that I have a second home to stay in when I go to Baton Rouge (IF I go to Baton Rouge again). Another great day in Southeast Asia! That course looked nice. Seems odd (to me) to see crinkle fries in Asia. The course was beautiful. That was a fun day…and a lot of strokes! !